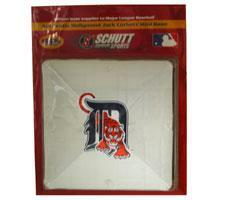 Detroit Tigers Official MLB Mini Base by Schutt | Sports Memorabilia! Detroit Tigers Official MLB Mini Base by Schutt. These MLB official mini bases have color team logos. The Mini Bases measure 7 1/2" squared.